Many electric drills designed for the home handyman have variable speed settings. Having a variable speed drill is very important if you are using a variety of bit sizes and drilling holes in both hard and soft wood lumber. 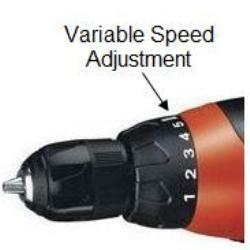 Although variable speed drills are popular, few handymen use the variable speed settings appropriately. Note: Some variable speed drills provide the variation in speed at the ON – OFF trigger. This type of speed control cannot be properly controlled as the operator’s pressure on the trigger will vary as the drill is used. In order to truly control the speed of an electric drill there must be some style of fixed speed setting mechanism, as shown in Figure 1. Table 1 provides the proper speed settings for different sizes of twist drill bits in hard and soft lumber. Table 2 provides the proper speed settings for different sizes of brad point drill bits in hard and soft lumber. Table 3 provides the proper speed settings for different sizes of Forstner drill bits in hard and soft lumber. Table 4 provides the proper speed settings for different sizes of spade drill bits in hard and soft lumber. Note: Hardwood ratings are for hardwood species with a Janka number below 1500. For hardwoods with a Janka number above 1500 use slower speeds.